Junior guard James Palmer. 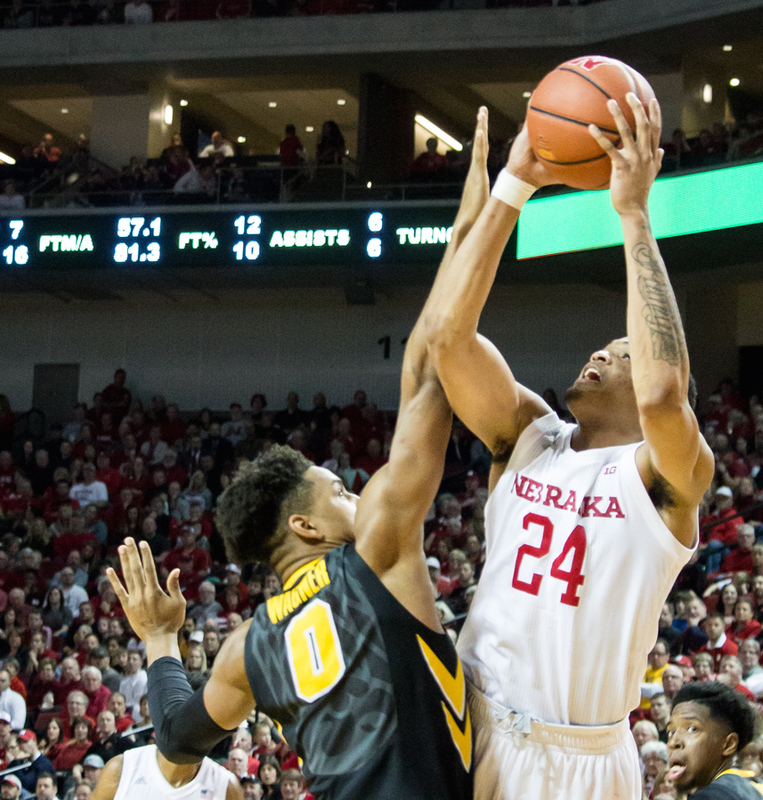 Jr. throws up a shot against Iowa’s Ahmad Wagner in the second half of Nebraska’s 98-84 win. The Huskers have now won four of their last five games. 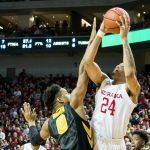 LINCOLN – Nebraska had big nights from their usual suspects and weathered a second half rally from Iowa to post a 98-84 win on Saturday night in front of a sold out crowd of 15,268 fans at Pinnacle Bank Arena. The Huskers (16-8, 7-4 Big Ten) were sharp offensively, shooting 57.7 percent (30/52) from the floor and scoring the most points in a conference game since Feb. 9, 2002. Junior guard James Palmer, Jr. led his team in scoring yet again, putting up a game-high 28 points on 7-for-12 shooting and an 11-for-14 performance at the free throw line. Palmer also had a team-high five assists. Since his season-low five points at Penn State on Jan. 12, Palmer has scored 19 or more points in the last five games in a row. “I think I’m more in a groove and my teammates are doing a good job of finding me, and I’m just making the play,” Palmer said. Junior forward Isaac Copeland had 23 points on 8-for-11 shooting, including 4-for-5 from the three-point line. He also pulled down a game-high 11 rebounds for his second double-double of the season. Nebraska had another big game from sophomore forward Isaiah Roby, who scored a career-high 17 points to go with eight rebounds, three blocks, two assists and two steals. “Roby just was steady all night and Copeland really, I thought, shot the ball and looked as good shooting it all week as I’ve seen him,” Miles said. Sophomore center Jordy Tshimanga, who played his most minutes since Dec. 22, was also key, scoring a season-high 11 points on 4-for-5 shooting. He also grabbed eight rebounds; the most he’s had since a win over Stetson on Dec. 29. Tshimanga’s rebounding effort helped Nebraska win the battle on the glass 37-28 against the team with the third-best rebounding margin (+5.7) in the Big Ten. Tshimanga also saw more minutes with Tanner Borchardt unavailable due to illness and Duby Okeke staying on the bench per coaches’ decision. Iowa played Nebraska in close quarters for the first 13 minutes of the game, trailing 30-26 with 6:50 left until halftime. The Huskers closed out the half with an 18-8 run to take a 48-34 lead into the locker room. Nebraska took a 16-point lead on its first possession of the second half, but the Hawkeyes then proceeded to go on a 20-6 scoring run over the next 5:16, trailing only 56-54 with 14:32 remaining. The Huskers regrouped, and went back up by double digits less than two minutes later. The Hawkeyes (11-12, 2-8 Big Ten) certainly had their moments, and had big performances from sophomores Jordan Bohannon and Tyler Cook, who each put up 24 points. It certainly wasn’t Nebraska’s best defensive effort. In fact, 84 points is the second most the Huskers have given up this conference season. Nebraska also got outscored in the paint 42-28. All things considered, Nebraska moved one step closer toward getting the appropriate number of wins needed for an NCAA Tournament berth, and now have sole possession of fourth place in the Big Ten standings. The Huskers have another quick turnaround, going back on the road Monday evening to face the Wisconsin Badgers (10-12, 3-6 Big Ten). Tip-off from the Kohl Center in Madison is set for 8 p.m. The game will be televised on the Big Ten Network.